Mystery Special Event on November 24th!! This however may be the new fortnight isle that was announced recently. However if there are any more surprises we will let you know soon!! 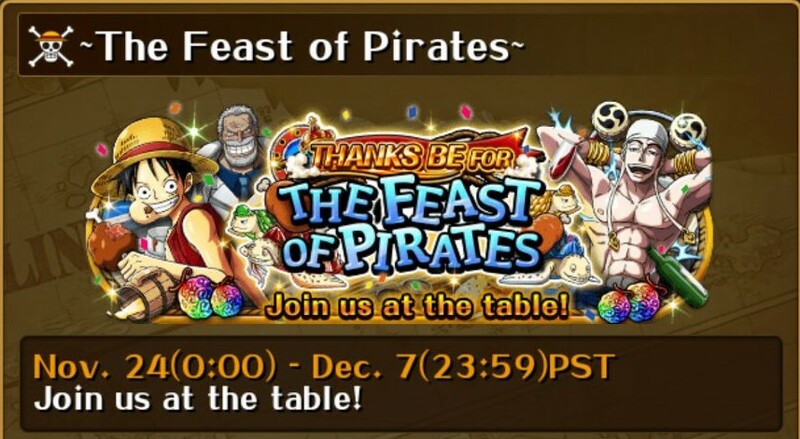 Probably the second best event in the upcoming week (after sugofest). 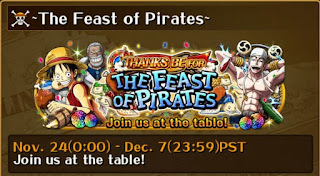 Since Ark Maxim is going to have 2x Drop rate we have an increased chance of getting the new skypiea units like Enel!! There is a 2x chance of now leveling up the special moves of the characters by same character synthesis or by skillbooks.. Time to use up all those saved up Marco, Ace skillbooks and the stored Blackbeards to get the special cooldown as low as possible!! During this event you will have 4 SUREFIRE chances of playing turtletime. This means you cannot miss them because you did not wake up for your turtletime! Introducing Choose Your own turtletime to Global OPTC! Yeah thats right!! we can now choose when we want to play our own turtletimes and then play for a limited time after starting it. Just make sure that you guys FINISH the turtletimes before 23:59 PST. Also make sure that the phone time and date is calibrated properly to avoid sudden closing of the turtle isle. Bandai has decided to give us a chance of special maxing our previous raidbosses again!! Make sure that you guys lower their cooldowns as much as possible! Monkey D. Garp: Dec 4(19:00)- Dec 5(18:59). Garp has the special to convert all orbs to either RCV or PSY orbs. He plays in tandem with Mr. 2 Bon Clay to get all PSY orbs and hence it is essential to lower his cooldown as well!